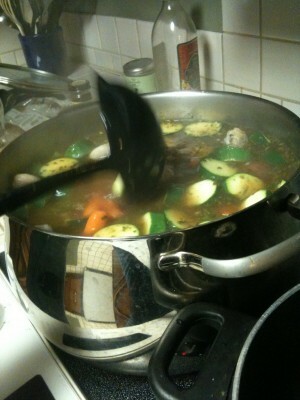 Chicken, potatoes, zucchini, carrots, pasta, lots of TLC, and other yummy stuff. Not only is it delicious, it’s also great carboloading! I received some great VM’s (virtual motivation – voice memos) to include in my BQ Playlist. I love listening to the voices and encouraging words from a few of the great friends that I’ve made over the years. After taking the raw recording and adding some background music using GarageBand, I began dropping them into the playlist. Similar to when I first used them to run Grandma’s Marathon, my placement of each within the playlist took careful consideration. The person’s voice, their message, and the songs on the list were just a few of the considerations. As I perused my list of recordings, I paused when I got to the old recordings. After not inserting it, one particular recording has lead to much personal torment. This recording begins with Tom’s voice urging me to “dig deep.” It’s follows with BoBo and DD intermittently cheering me on. My finding new love is NOT the reason I hesitate to use it. On the contrary, having loved to the death-do-us-part phase is what allows me to open up my heart so freely – scary as it is. I know that Tom would be happy that I am open to finding love again. At its origin, this recording was created solely to cheer me on when the family was not able to be with me on race day. It served as a reminder of love’s strength. No matter how far apart we were, I always had my family’s love with me. NOW, this same recording is what little I have left. And when I listen to it, I sometimes smile. Other times, however, I cry. The latter is the reason why I wouldn’t use it, but he 1st is why I would. As my mind torments over which to do, I cry and cry some more. I re-experience the loss and even feel a twinge of guilt for entertaining leaving it behind. It’s just too much. What am I to do? Filed Under: What else is there? It was Tom’s biggest complain. I did it; he hated it. He even went as far as to say that it, nagging that is, created cancer. *sigh* I’ll leave that accusation alone today. I’ve waited too long for the wound to scab over to pick at it – even gently. These days, it’s BoBo who complains about my nagging. Like father, like son I guess. He can’t see that he pushes me to the point of complaint and then continues to push even further. Never does the fact that I’ve worked all day only to shift from that job to the job of parenting. After a full day’s work, kid shuttling, and sitting in the cold waiting for football practice to end, I’m exhausted. So when I reach for the frying pan well after the neighboring houses have finished washing their dinner dishes I don’t want to find it dirty, or missing. Nor do I want to find the food which was intended for the meal to be used up (remnants in the trash.) And when I do… I complain. ‘Cuz I am tired, it’s late, and I have hungry mouths to feed – even if I’m not anymore. I leave the pile of bills for yet another day – when I have a bit more energy and, in doing so, I hear them nagging at me all through the night. Nag, Nag, Nag.